In celebration of National Family Caregivers Month, we’re sharing the stories of other bloggers and caregivers. Today guest blogger Karen Sebastian gives practical tools for caregivers to implement over the holidays. Food and the holidays are linked especially during Thanksgiving. As the smell of pumpkin pies baking mingles with the savory aroma of the turkey that is browning in the oven it feels like home. 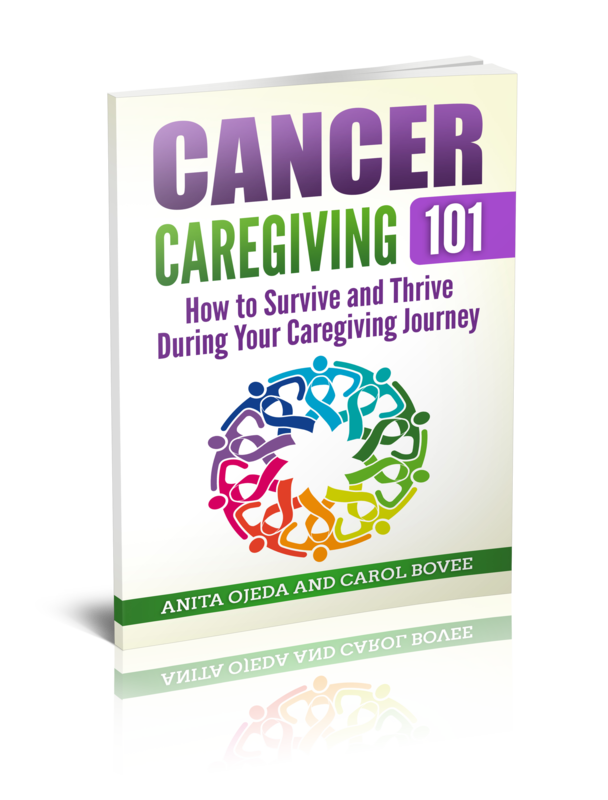 As I look back over my role as a caregiver, I have to admit that one of the hardest holiday seasons was the first year that my husband, Bill, could not sit down and eat with us because he could no longer swallow. He lost his ability to swallow and received his nourishment through a feeding tube. I was tempted to skip hosting the traditional meal at our home but decided to keep things as normal as possible for everyone. It was hard. Everyone tends to congregate in the kitchen to taste and nibble on the turkey as it is sliced. The tastiest morsels are right there as you make the final preparations and get it all ready to put on the table. As we were carrying on about how yummy it all was, I felt a wave of sadness hit me because Bill would not enjoy this wonderful shared experience that we take for granted. I went into the den and gave him a big hug. “I’m so sorry that we are carrying on so much about how delicious the food it when you can’t have any,” I said softly. That particular year he did not sit with us at the table. After eating, we joined him in the den to share our expressions of gratitude. The Sebastian family the year this story takes place. The holidays are stressful anyway yet when you add the components of a caregiver’s responsibilities, it can be even harder. What do you do when the rules change? How do you handle giving up certain traditions? How to you navigate the sorrow you are feeling? Our holidays can be weighed down with traditions and expectations that we carry out routinely without examining why we do them. This is a wonderful opportunity to ask your family what they enjoy doing. Ask the one you are caring for what they most feel capable of doing. You don’t have to do it all. It doesn’t have to be perfect. In our case, we gathered around my husband and shared our gratitude list. We started with the youngest and moved up the age ladder. He closed our time together with wise words and a profound prayer. Sometimes less is more. The whole purpose should be to spend some time together. Let go of the date and use alternate ones that best coordinate with hospital visits and/or other demands. Take lots of pictures. Urge those who normally would not want to have a picture taken to do so. They will treasure it in the years to come. Laughter abounds when we get together if we will lay down all expectations for perfection and specific outcomes. In our busy lives, these times together are precious. Don’t let hurts from the past rob you of the joy of today. The key to living a life with no regrets is to let the children lead the way with their joy and pleasure in the present moment. For this special time, lay down the worries for the future. This holiday is a precious gift. Enjoy it. Thank you, Lord, for the many promises to give us strength when and where we need it the most. As we enter this holiday season, I receive from you the dignity and peace of knowing that I am serving You as I care for my loved one(s). I thank you for the grace to remove all external trappings of what this holiday should look like. As you carry the burdens this year, we invite You in to our celebration of gratitude and life together. Fill our hearts with laughter with no fear of the future because You will walk with us through it all, just as You have up until now. I receive your joy and laughter in our lives. In Jesus’ name. Amen. Karen Sebastian is an author, blogger, and gifted speaker who transparently shares the hope she has found in the darkest times of her life. As an ordained minister, she served as co-pastor of several churches alongside her husband, Bill, who has now moved to Heaven. She also founded HOPEpreneurs, a consulting firm dedicated to helping women succeed in the marketplace. Affectionately known as The Hope Lady, Karen takes every opportunity to inspire hope both personally and when speaking. Karen lives in Dallas, Texas, close to her children and grandchildren. You can find more of her adventurous discoveries of the beauty of hope in a dark, cloudy world at her blog. http://www.karensebastian.com.